A manufacturer of nutrition products who was experiencing a timing issue on the conveyor speed of their assembly line sought Shimpo in search of a solution. This factory ran production on a vast number of their organization’s products which varied in size and weight. Due to the large variation in the product mix, the weight fluctuations produced varying conveyor belt speeds. The result was the disruption of subsequent stations further along the assembly line. To help analyze the issue, the first step was to measure and record the different speeds associated with each product. 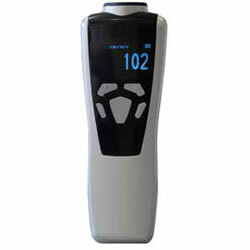 The instrument that was recommended was the DT-2100 Data Logging Laser Tachometer. The DT-2100’s non-contact, laser design combined with threaded insert allowed the unit to be permanently mounted on a nearby beam. Consistent line speed readings could be acquired from a safe distance. For their tests, they also utilized the tachometer’s data logging software which provided live speed recordings of their test runs, plus enabled them to further analyze the data after the tests were completed. After gaining sufficient readings they were able to calculate the expected belt speeds produced from the cor-responding product loads on the line. This provided them the corrective adjustments necessary on the motor output to buffer out alterations in speed, producing a steady, efficient production run. After a relatively minimal amount of time the customer was able to solve the speed variations and associated disruptions to their produc-tion line. The savings in efficiency paid for the equipment and test time in a matter of weeks.